Easy Wi-Fi connect & setup for immediate IT & facilities physical environment monitoring. Includes built-in sensor for digital temperature, Device ManageR software & “PUSH” technology. Includes built-in Wi-Fi capabilities, 5V Power Adapter & online Room Alert Account dashboard. 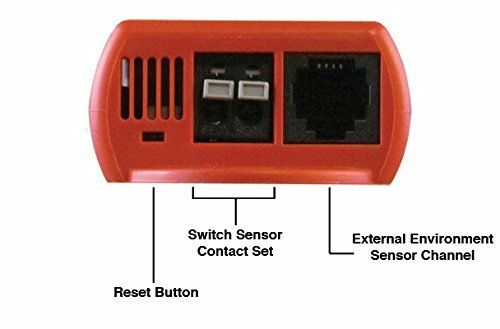 Includes ports for 1 additional digital sensor & 1 switch sensor or dry contact. 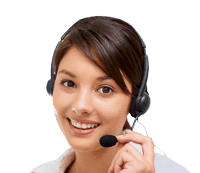 Offers advanced alerting by email, email-to-SMS, webpage update and more. 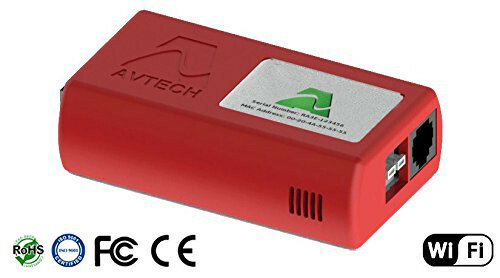 This product is AVTECH’s most economical wireless solution for “IT & Facilities Environment Monitoring, Alerting & More”. It is designed specifically to assist with monitoring room temperature and other environmental conditions where a small footprint is needed, where access to a standard Ethernet connection may not exist, when the investment cost needs to be minimal or deployment volume may be high. 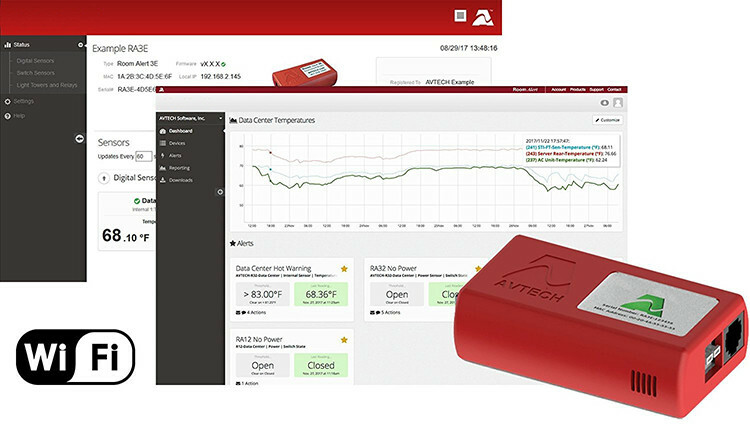 Add a digital sensor and switch sensor of your choice to expand monitoring with an easy “click connect”. This product’s environment monitoring device will work anywhere a Wi-Fi connection is available, simply use the included power adapter, connect to the Wi-Fi network and you are good to go. 30% of all downtime and data loss is caused by environment factors not normally monitored by traditional security hardware and software. Don’t let an environmental factor cost your organization lost revenue due to downtime! Invest in this product to fully protect your facility, assets, and critical data. By attaching external sensors, this product is the perfect host for specific and targeted monitoring with a focus on keeping costs contained. It offers an easy to use web browser interface for settings changes and viewing real-time temperature and other environment sensor status from anywhere. 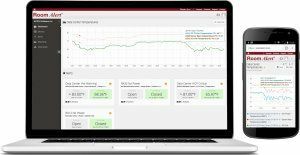 This product package allows real-time temperature and environment monitoring, logging, one click data export, advanced alerting, Fahrenheit/Celsius, high/low watermarks, temperature values in alerts, custom alert text and more. Easy Wi-Fi setup for remote temperature and environment monitoring from anywhere. Use the bundled Device ManageR software or your account to monitor. This product package includes a license for AVTECH’s powerful Device ManagerR application software, an advanced solution for the discovery, management, logging, graphing, advanced alerting and more of AVTECH’s IT & Facilities Environment Monitoring hardware. It runs as a Windows Service and automatically discovers AVTECH’s hardware units across the network, allowing users to immediately be informed when environmental thresholds are passed. 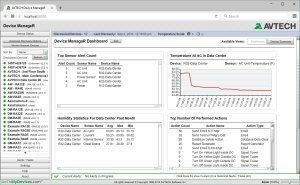 Device ManageR’s web browser interface allows users to view and manage any or all units on their network, graph and log sensor data in real-time or over a specified date range, send out alerts if an issue or event arises, and much more. Plugins are optionally available for Windows/Linux shutdown, reboot and/or log off; dial out via GSM, text or voice modems; advanced reporting, and more. New “dashboard” capabilities allow users to create the interface they desire, for their unique needs. The Account Dashboard is AVTECH’s state-of-the-art online monitoring service designed for new and existing users. 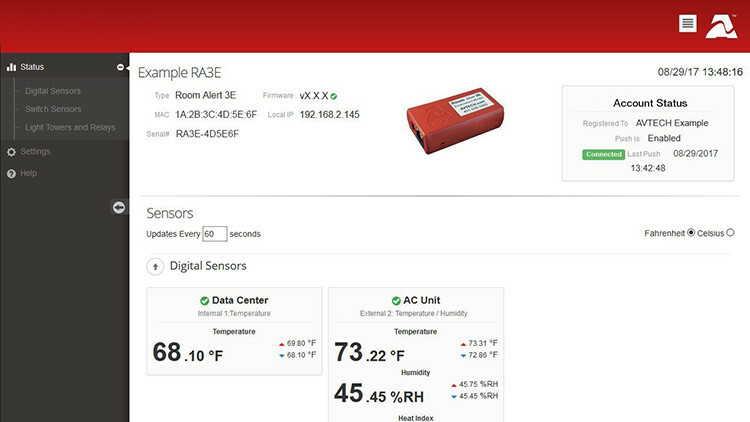 It provides the ability to easily monitor temperature and environmental conditions from anywhere, at anytime, via the web. Regardless of your web interface of choice, the look, function, and entire user experience is always the same. Use your Account to view all connected sensor and monitor devices without the need to install software, configure an email server, or worry about network concerns. Users can monitor, alert, log, graph, view, report, map, manage and protect their facilities with both ease and confidence. This product can easily monitor environments such as phone or wiring closets, critical rack cabinets and other facilities of all types. Since this product is connected via Wi-Fi and does not require a host PC for operation, it can be located anywhere a Wi-Fi signal is available. Sensors can be run inside a rack cabinet, air vent, sub floor or other location. This environment monitoring device will help to protect valuable IT equipment or other property and minimize downtime if a disaster should occur. It can also be used to manage utility use by monitoring power consumption, allowing possibilities to reduce energy costs. 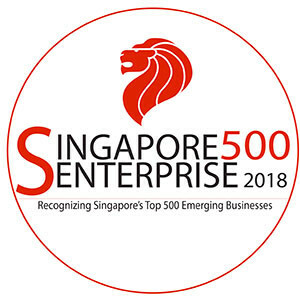 This product can also be easily used in non-technology environments like residential and commercial buildings, restaurants, warehouses, green houses and much more. The possibilities for use are endless.